Home Food Health and Food A Shocking Fact: Salt Is Everywhere! Here’s some newly released information from CDC about salt consumption of Americans. It’s not only Americans that have a salty taste, but it’s also true for many other people around the world. Probably salt is the common point of all foods in the world! The bottom line? Americans would be better off eating less salt. 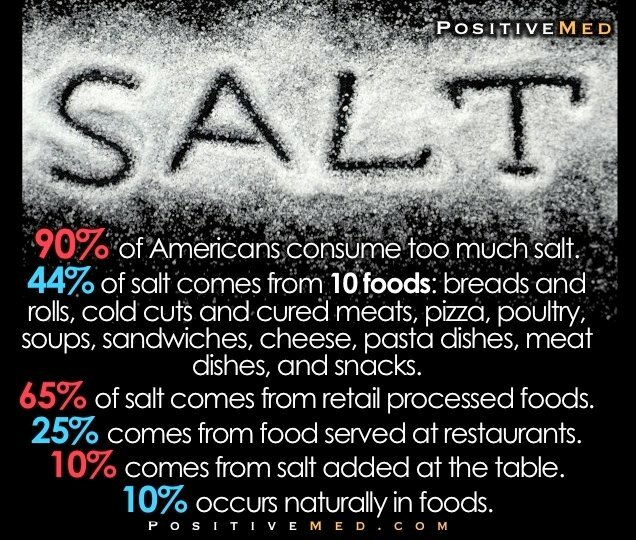 Interesting fact is that only 10% of our daily salt comes from the salt added at the table. The majority of salt is coming from processed food and this is also the major target if we want to reduce our daily salt intake. But from the standpoint of the food industry, reducing dietary sodium is a big problem. From the business case, it’s expensive, risky, and difficult. Although manufacturers have gained huge progress in the past couple of years on sodium reduction, but there’s limited room for further progress. Simple fact is that manufacturers don’t tend to spend tons of money on something that doesn’t bring any profit in return. As an example, bakers or cheese producers have to spend millions of dollars on re-inventing their formulas and on the other hand, customers are not willing to pay more for less salty products. If you’re interested in more health information about salt, please visit CDC’s website.